Our long-awaited browser for DApps, App Square, is officially available in the Infinito Wallet, version 2.4. With the release of this DApp “store”‘, Infinito Wallet is now more than a universal home for leading coins and tokens on the market, its a palace in which to showcase limitless blockchain apps and services. Currently, App Square supports DApps built on Ethereum blockchain. Soon, DApps built on EOS, NEO, Ontology and more will be added to the Universal Wallet. There are 2 types of DApps, web-based apps that run on browsers, and native apps that can be downloaded onto your device via an App Store and Google Play Store. Both are supported by App Square. 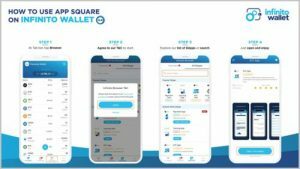 If you have an awesome DApp and want instant users, apply to have it listed on App Square today via info@infinitowallet.io. Being listed means your DApp engage our massive community of more than 60,000 active monthly users among 400,00 downloads pr month. Infinito Wallet’s core development team of blockchain R&D experts has intensive professional experience. Currently, our organization consists of more than 300 members including developers, designers, business and marketing specialists. We are promoting research on infrastructure for cryptocurrencies, and developers utilizing blockchain. Visit https://www.infinito.io, https://www.infinitowallet.io, and https://platform.infinito.io/.